I’m only 8 days late. Luckily for me, this year on February 24th the Republic of Estonia (Eesti Vabariik) celebrated the 90th anniversary of its declaration of independence, so the celebration is going to continue all year long. So I’m actually not late at all 🙂. 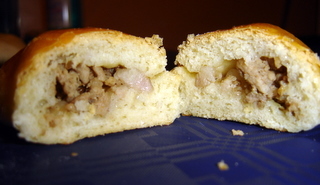 One Estonian staple I wanted to try to make by myself was pirukad, Estonia’s dough-stuffed-with-meat offering (every nationality seems to have one—pelmeni, pierogies, empanadas, etc…). I had helped my mother make them before, but never done the entire process from start to finish, so I had to give it a shot. When Pirukad are completely cooled, they can be put in Zip-Loc bags and frozen for later use! They last a LONG-LONG time! Just re-heat them! Microwave is OK! A real oven is better (they don’t get mushy!). BUT!!!! Who cares? They are good any way you fix them! This particular advice is given in the middle of the recipe. Um, yeah. Also, the instructions hardly include any measurements. 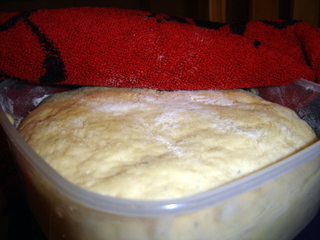 Which is why, soon after I added the risen yeast to the warm milk-and-butter mixture, I ran out of flour. DAMN. Luckily there’s a grocery store right across the street, but still, I was terrified the half-done dough would rise too much while I was gone and subsequently be ruined, or something (I don’t know very much about yeast dough…). It was pretty nerve-wracking. I guess I could’ve put it in the fridge to keep it from rising, but the mixture was so warm, I don’t think the fridge would’ve helped. 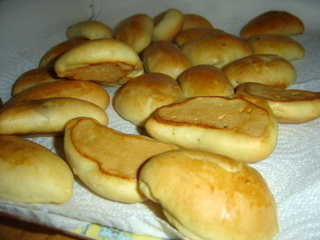 Once I had obtained flour and mixed it into the dough until I reached the “hard-soft” texture described, it didn’t seem too much the worse for wear. I let it rise as I prepared the meat filling, which I made up off the top of my head. 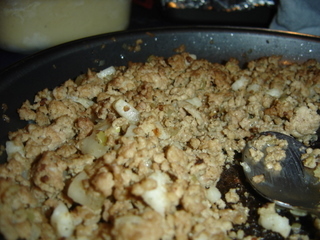 I like pirukad with ground meat filling, so I cooked 2 parts ground pork to 1 part ground beef, and added salt, pepper, and finely chopped onion. I had also diced some bacon (big, fatty slices) and added that, hoping it would impart a nice flavour to the mixture, but it didn’t seem to do anything for it. Next time I’ll just leave it out, or try with some suitsupekk (smoked fatback, mmm). I also added a chopped hard-boiled egg to half of the filling mixture. The rest of the process went smoothly—gently pulling a handful of dough into a long snake, cutting it into marshmallow-sized pieces, squashing each piece flat, putting a spoonful of filling in the middle, and sealing the edges together. The dough behaved very nicely. 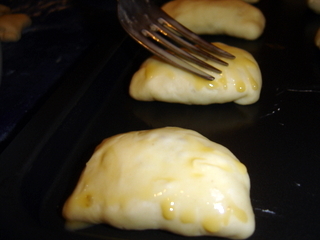 The pirukad were also treated to a brushing of egg and water mixture to make them shiny (as you can see, I don’t have a pastry brush, so I gently used a fork). 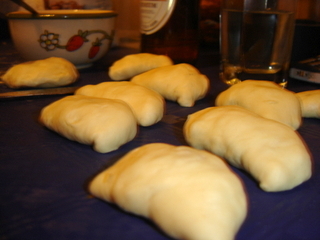 (I don’t know how many pirukad I made exactly, but I was engaged in this filling process for a few hours. Melrose Place on DVD kept me company :-)). truth on the other hand I will certainly come again again.